Well, happy Thanksgiving week, everyone. Can you believe how fast this year has gone? Believe it or not, Miss Allie’s Kitchen will be celebrating its 6 month anniversary in just a few short days. Where did all of that time go? For me, most of the time was spent in the kitchen, as you might have guessed! 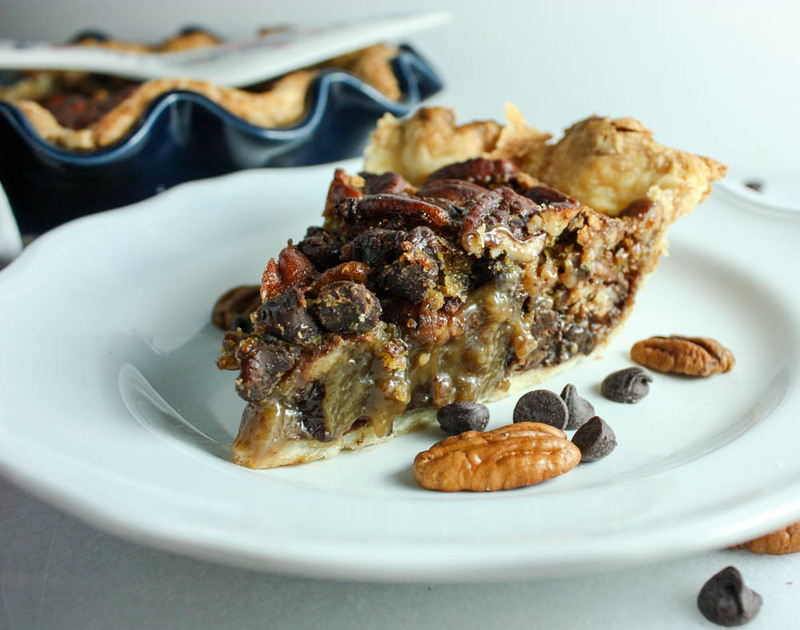 This week, I’m introducing this tried and true, family favorite, Chocolate Chip Pecan Pie. 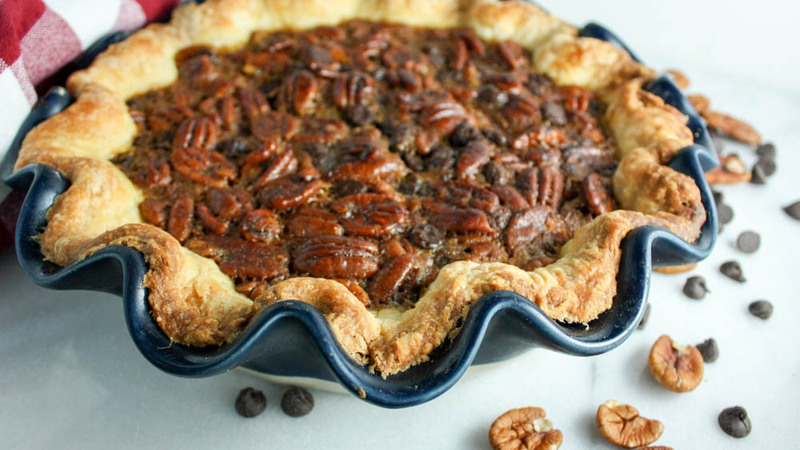 This pie has always been sort of a celebrity around the holidays in my family. 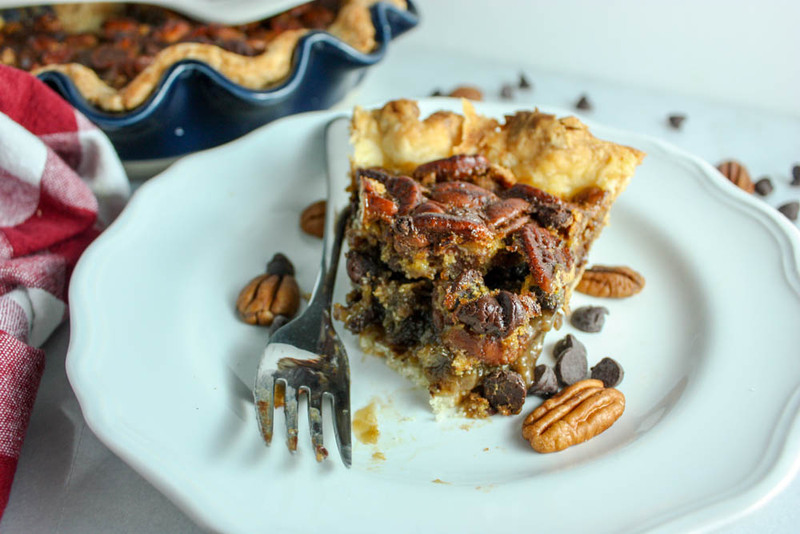 This is the pie that I get phone calls about…”Oh, Allie can you bring that pecan pie stuff that you make?”. 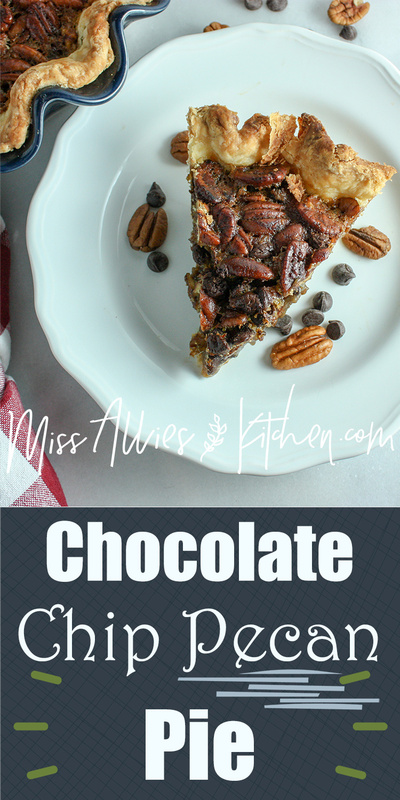 The answer is always yes, so you know that calls for some recipe sharing on Miss Allie’s Kitchen. I’ve served this before and people sort of look at me funny: “Wait, this does not look healthy”. And, no folks it isn’t. While it is all natural and completely homemade, we ain’t skimping on the buttah & sugah y’all. (Where’s my girl Paula at?!). During the holidays (and the rest of the year) I let myself live a little. And I think you should, too! 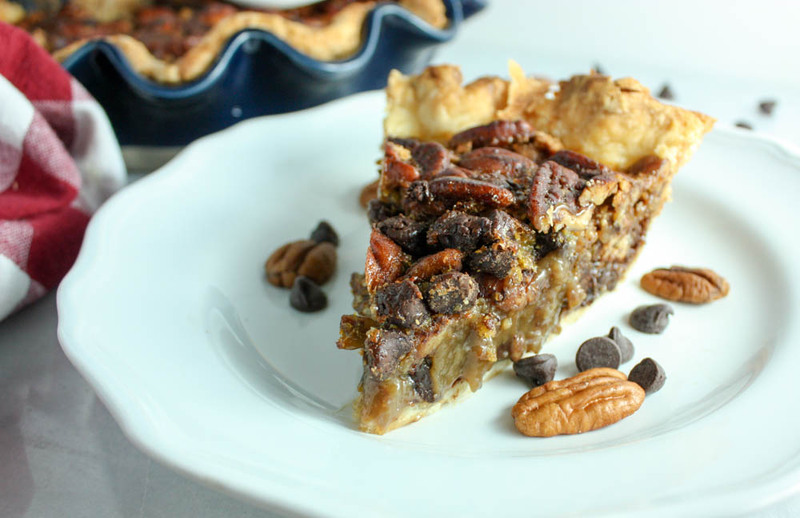 If we’re eating a well-balanced and nutritious diet, a piece of ooey, gooey, chocolatey pie isn’t going to kill us. And yes, it may take a little longer to prepare with that homemade crust, but come on, your awesome family is worth it. Let’s go back to the ooey gooey. 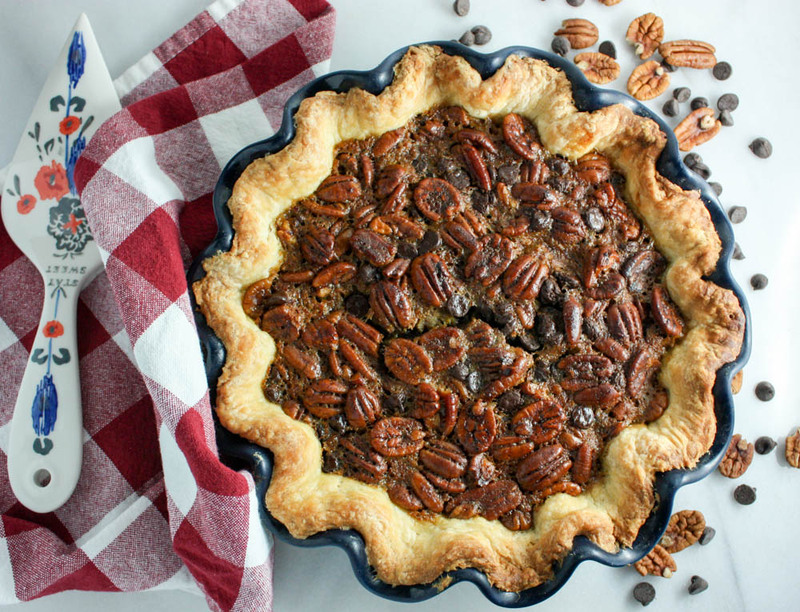 Pecan pie gets a bad rap because well, of the nuts. But this is not nut pie. 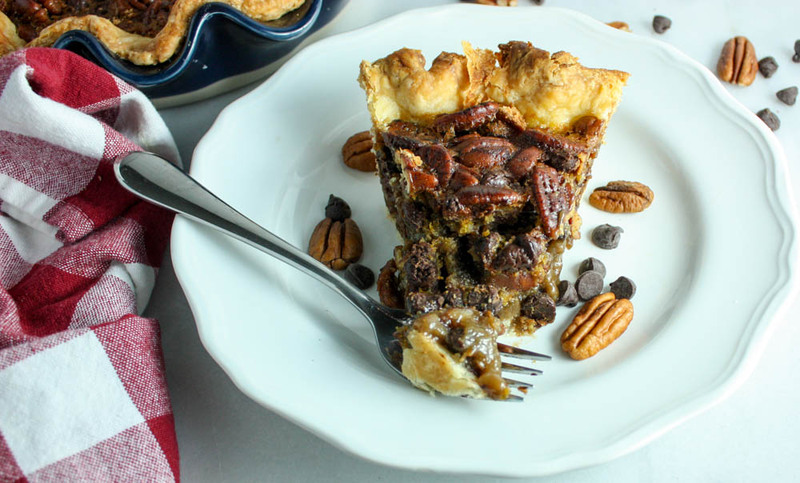 This is cover me in a blanket of caramel heaven with folds of perfectly toasted pecans and swirls of chocolate richness pie. That’s what this pie is. And it converts the wariest of pie eaters EVERY SINGLE TIME. 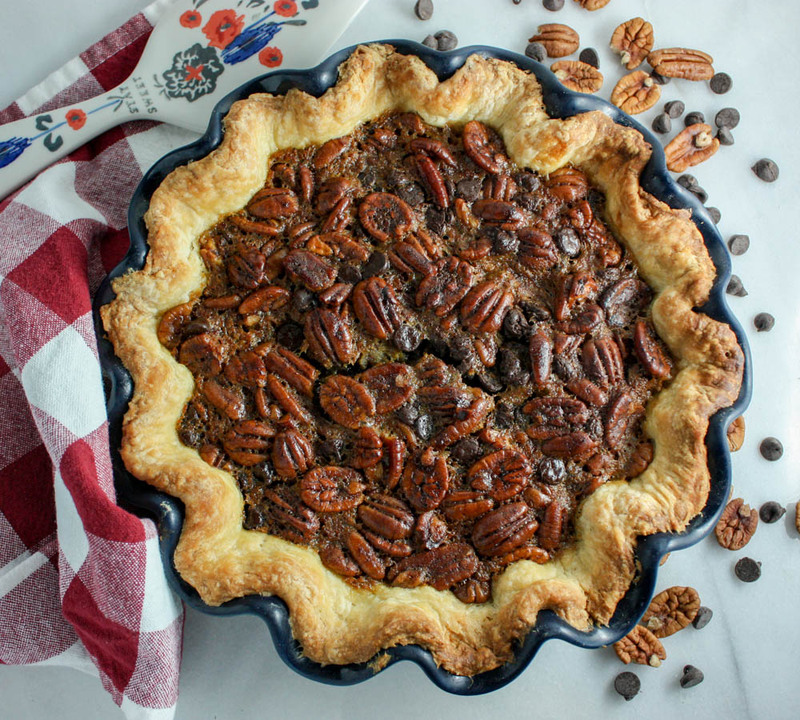 This recipe comes from the same cookbook that my pie dough does, The Complete Book of Pies by Julie Hasson. I did make one swap, we’re using brown rice syrup instead of light corn syrup. I’m not a big fan of corn syrup, so I decided to use something more naturally processed and with less fructose. I don’t love brown rice syrup as much as say, maple syrup, but the thickness was the perfect texture to replace the corn syrup. I swear by this book, and if you’re a pie person like me, check it out! 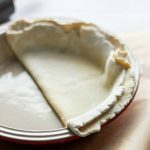 I used my tried and true pie crust here, if you’re a first-time pie maker, check out the details here. I’ll list the pie dough ingredients below, as well. If you’ve never made your own dough before it is VERY easy, you just need to follow along step by step. 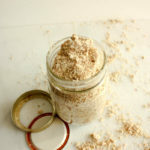 Brown Rice Syrup – if you can’t find this in the baking isle – try here! First, you’ll want to make your pie dough. You can again, follow my method here, or use a recipe you like! When your dough is made and is properly chilled, put a skillet or pan on medium-lo heat. Add your pecans and toast for 2-5 minutes, or until they just begin to deepen in color and are fragrant. Let these cool and melt your butter in the microwave and allow it to cool for a minute. We’re using quite a bit of eggs and we don’t want hot nuts or butter to cook them. Combine melted butter, pecans, 1 tbsp. of flour, brown sugar, brown rice syrup, salt and vanilla in a bowl. Mix. Crack and whisk your eggs in a small bowl and pour them into the pecan mixture. Lastly, add the chocolate chips. If your pie dough isn’t pressed into your pie dish, do so now. Pour the chocolate-pecan mixture into the unbaked pie shell. Slide the pie into the oven and don’t touch! Let it bake for 50-60 minutes and remove it when the filling is set, or it doesn’t look too wet or jiggly in the middle. This will take about an hour to cool, but you can make it a day or so ahead of your next event. This chocolate masterpiece best served in GENEROUS portions with a heaping side of whipped cream. Happy Thanksgiving! Don’t forget to follow Miss Allie’s Kitchen on Facebook. Tell me! What are your plans this week? And your favorite Thanksgiving dessert? First, you’ll want to make your pie dough. Follow my recipe linked in this post! When your dough is made and is properly chilled, put a skillet or pan on medium-lo heat. Add your pecans and toast for 2-5 minutes, or until they just begin to deepen in color and are fragrant. Let these cool and melt your butter in the microwave and allow it to cool for a minute. We’re using eggs and we don’t want hot nuts or butter to cook them. Combine melted butter, pecans, 1 tbsp of flour, brown sugar, brown rice syrup, salt and vanilla in a bowl. Crack and whisk your eggs in a small bowl and pour them into the pecan mixture. Lastly, add the chocolate chips. If your pie dough isn’t pressed into your pie dish, do so now. 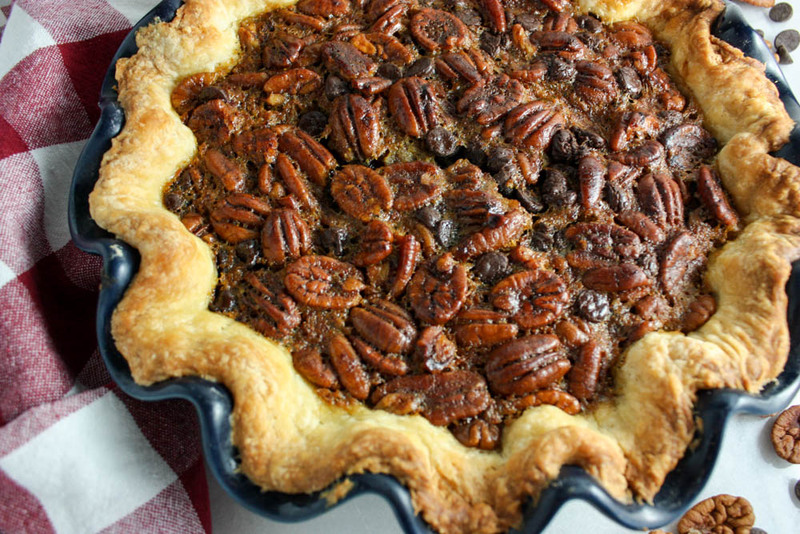 Pour the chocolate-pecan mixture into the unbaked pie shell. Slide the pie into the oven and don’t touch! Let it bake for 50-60 minutes and remove it when the filling is set, or it doesn’t look too wet or jiggly in the middle. 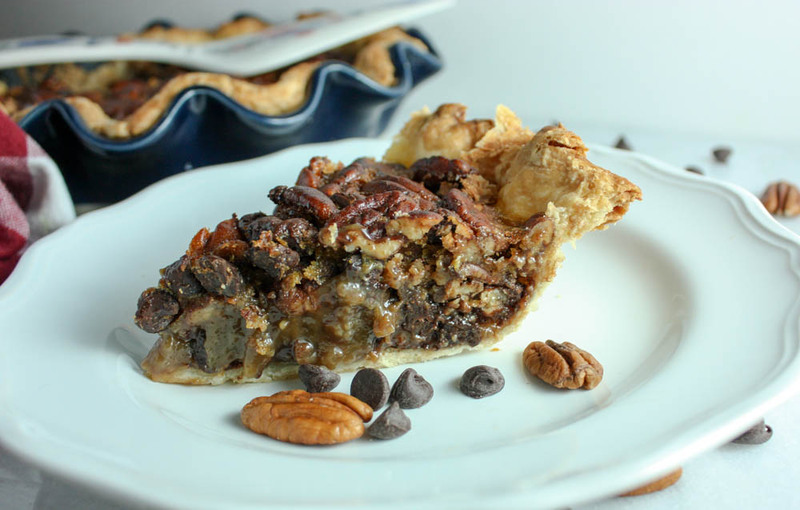 I’ve never been a pecan pie fan, but I think that’s because I’ve never had one with chocolate in it!! So I’m sure I would LOVE this. Happy Thanksgiving Allie! I always find that it is the kicker! Same to you! And I hope you get to try the pie! !